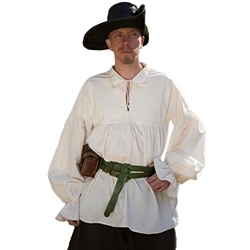 The pirate shirt is a timeless shirt perfect for fairs, LARP and Cosplay. This medium weight cotton shirt features tied cuffs, laced v-neckline collar and ample full length sleeves. A great look for pirates, swashbucklers and musketeers. Care Instructions: Machine washable in Hot water with similar colors (Wash separately first time). Do not bleach. Tumble dry on low heat (may shrink 5%).